At Cold Lake, our main role was search and rescue (SAR). We were primarily mandated to support the CF-18s from the Cold Lake fighter base in case one of them had a problem which required the pilot to eject in their training area which consists of a large swathe of northern Alberta and Saskatchewan. As well, we also responded to civilian search and rescue situations in Western Canada. In the two and a half years that I flew at Cold Lake, I responded to a variety of searches, some with happy endings and others not so. At the time, Sheri and I were still not posted together as upon her graduation she was posted to CFB Edmonton. Cold Lake was a bit of an improvement as I was at least able to travel down to see her most every weekend. The 18 months before this we had only been able to maintain contact through telephone calls, old fashioned Canada Post letters, and the occasional trip during breaks in our training. However, we made it work and were married in Aug 1997. Our honeymoon was spent moving into an acreage we bought just north of Gibbons. For the first year or so of our marriage we were still living apart, with me in Cold Lake and Sheri in Edmonton. In Oct 1999, I was finally able to receive a posting to 408 Tactical Helicopter Squadron in Edmonton. After two years of a long distance relationship, and then a further two years of married life where we only shared a household on weekends, Sheri and I would finally be able to live together under one roof. 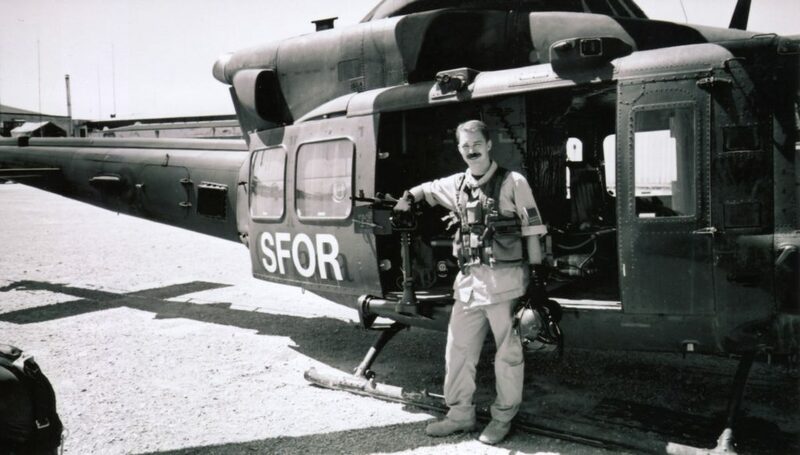 Myself and a CH-146 Griffon during the first of my two deployments to Bosnia. When I arrived in Edmonton, 408 Sqn was standing up a detachment for imminent deployment to the former Yugoslavia to assist with the Peacekeeping efforts there. I was added to the roster and deployed to Bosnia in Feb 2000. The timing was actually quite fortuitous as Sheri was also scheduled to got to Bosnia as the Supply Platoon Commander. She arrived in Bosnia a few weeks after I, and we were both stationed at Camp Velika Kladusa. Although we had separate quarters, the opportunity to see each other almost every day made this deployment enjoyable and the time passed quite quickly. When we deployed in early 2000, most of the open fighting had ceased in Bosnia. However, a sullen stalemate had set in with the various factions jockeying for position. Bosnia was split into three territories, and the governments that were notionally in charge of them did not have the ability to effectively provide services to their populations. As such, gangs and warlords became the main threat to efforts to recreate a civil society. For our helicopter detachment, our main job was to transport people and supplies between the different camps. Bosnia is a very mountainous country with a challenging road network which had been ravaged by years of civil war. Another legacy of the civil war was the untold numbers of land mines littered the countryside. Flying by helicopter got you to your destination four to five times faster than driving, and bypassed the land mine threat. Upon return to Canada, we were finally able to start having a regular marriage and live together full time. In May 2001 Sheri completed her initial contract with the military and decided to not renew her service. Instead, she found herself with a new calling. On her last official day in the military, we were blessed with the birth of our first son, Ethan. In 2003 our second son, Isaac came along. March 2004 saw me deploy to Bosnia for another 6 month tour of duty. We were still based at Velika Kladusa, and still flew the same types of missions. However, the change in the countryside was fairly dramatic. New construction was seen throughout, most of the burned out tanks and armoured vehicles that previously dotted the countryside had been removed. At night we could see that areas which used to be completely blacked out were now awash with lights, showing how the repair of the electrical grid had progressed. However, this deployment marked the first time that I was to spend a significant amount of time away from my young family. Missing this 6 months of memories of my young sons was the most challenging part of the deployment.